We’d love your help. Let us know what’s wrong with this preview of Ravens in the Library by Phil Brucato. To ask other readers questions about Ravens in the Library, please sign up. Ravens in the Library was a thick book of very short stories that were mostly thick, dense, filling stories, each with its own wild flavor. Despite my usual swift habit for book consumption, I simply could not get through Ravens at any particular speed. It reminded me of an intellectual box of truffles. Two or three stories were plenty enough at one sitting, thanks. I would bite into one without knowing what the center (ending) was going to be, and I was happy not to know. It was all a grand gus Ravens in the Library was a thick book of very short stories that were mostly thick, dense, filling stories, each with its own wild flavor. Despite my usual swift habit for book consumption, I simply could not get through Ravens at any particular speed. It reminded me of an intellectual box of truffles. Two or three stories were plenty enough at one sitting, thanks. I would bite into one without knowing what the center (ending) was going to be, and I was happy not to know. It was all a grand gustatory adventure through stories that were not dedicated to happily ever after sweetness nearly so much as gaining a new understanding of the nuances of humanity. Most of the time I was at least interested in the flavors; only one or two were horrific enough to leave me shuddering after. I can tell you that some of the authors are powerhouses (Gaiman, De Lint, Constantine), and just as many were totally unknown to me. The last three entries were all on the Peter Pan theme, which might have been boring were they not all so unique from each other. It's almost 4AM here. Too tired to write a more robust review. I really liked this collection of short stories and I have a few I liked more than the others, but no story really stank. I'm glad to contribute to helping Sooj pay for her medical bills. I love her soundtracks for three of Catherynne M. Valente's stories. Fabulous. All of the stories are good. Some are stellar. Seanan McGuire's "Lost" made me cry in a good way. I just received this book in the mail, and I cannot wait to read it. WHY? Because my beautiful friend Jaymi Elford has a story in it! Along with Neil Gaiman, Charles de Lint and a plethora of other authors. This book was put together to help with medical bills for a performer, S.J. Tucker (Sooj), and how cool is it that Jaymi has a story in it?! ETA: I've started reading this one, and so far love all the stories. Because it's a collection of short stories, it waits on my de I just received this book in the mail, and I cannot wait to read it. WHY? Because my beautiful friend Jaymi Elford has a story in it! Along with Neil Gaiman, Charles de Lint and a plethora of other authors. This book was put together to help with medical bills for a performer, S.J. Tucker (Sooj), and how cool is it that Jaymi has a story in it?! While there were a few stories that just didn't speak to me, this anthology (on the whole) is quite good. As usual, the de Lint and Gaiman stories were my favorite of the bunch, but other standout authors/stories (IMO) were Terry Windling, Shira Lipkin, Angel Leigh McCoy, SatyrPhil Brucato, Alexandra Elizabeth Honigsberg and Laurel K Hamilton. It definitely makes me want to pick up a Sooj Tucker CD and hear the vocals to go with some of her lyrics. 2010 Reread--Even more excellent than I remember While there were a few stories that just didn't speak to me, this anthology (on the whole) is quite good. As usual, the de Lint and Gaiman stories were my favorite of the bunch, but other standout authors/stories (IMO) were Terry Windling, Shira Lipkin, Angel Leigh McCoy, SatyrPhil Brucato, Alexandra Elizabeth Honigsberg and Laurel K Hamilton. It definitely makes me want to pick up a Sooj Tucker CD and hear the vocals to go with some of her lyrics. Go here. Buy it. $25. I happen to be on SatyrPhil's LJ. It's only available for a limited time. They're already almost out of the first print run. i'm not sure if i'm done reading this or not; i have certainly put it down. some of the stories are interesting, but very few so far are memorable for me. it takes a lot for a short story to really get my attention -- there is just not enough time for real character development before the thing is over. the artwork is beautiful, and if you like short stories, this seems to me like a good collection, spanning a range of styles and topics, in the theme of magic. 2 years ago SJ Tucker was the musical guest of honor at Arisia, a local science fiction convention in the Boston area. I had already been a fan of her work so I was very happy to pick up a copy of this benefit book. There are so many talented authors that contributed to this work. Although I am not generally a huge fan of short stories, I did enjoy the chance to read a bit by some authors in the community I was less familiar with in addition to some of the bigger names. Overall I loved it. There were a few stories, while still good, that weren't to my particular taste, but the collection brought together over ten authors I'm very fond of. I will say one thing about an individual story though: "Lost" by Seanan McGuire made me break down into tears. Even if I didn't love plenty of the other stories, it would have been worth it to me for "Lost" alone. 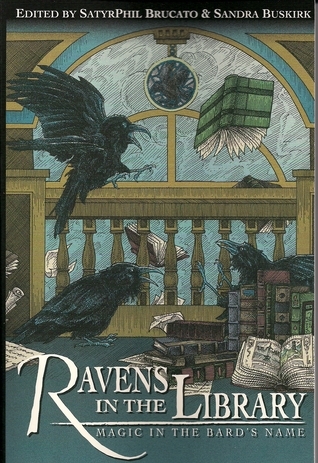 Ravens in the Library is an excellent collection of stories by Laurell K. Hamilton, Seanan McGuire, Neil Gaiman, and several others. I look forward to opening its magic again and again. Created as a fundraiser for bard extraordinaire S.J. Tucker, the anthology just goes to show that fairy tales with happy endings still happen. I really liked this collection. All the stories seemed to fit together. My favorites were "Ice" by Francesca Lia Block and "Forbidden Brides of the Faceless Slaves in the Nameless House of the Night of Dread Desire" by Neil Gaiman and "Fortune" by an author I didn't know of, Shira Lipkin. This is a charming collection of magical stories, poems, and illustrations. It's a wonderful read. I recommend picking up a copy of it while it's still available. Beautiful stories, and a beautiful purpose behind this anthology. This is a genre I could like after all. Great collection of mystical, magical, musical stories. Lots of lively stories, some lingering. Great book. Some really interesting and different short stories and endings.